couple weeks ago when out visiting new forest farm, i obtained some seed stock for chestnuts and hazels. these are improved varieties, created from crosses, and so i really can’t be sure what sort of mutt of chinese/american chestnut we will be having. it’s very exciting to think of all the chestnuts and hazels we will be able to plant out around the city in the next couple of years, but i’m also fascinated to think of the continuing of breeding away from mark’s farm. by isolating these improved varieties and then making crosses from selections that have particular promise, we can breed varieties that are even better than the stock we started with, as well as more well adapted for our local. i’m just wondering how these trees will differ from the trees mark goes on to breed, or anyone else that mark has given seed to. i was given very specific instruction from mark about planting. hopefully i have followed them well enough, and we will get some nice hazels and chestnuts sprouted next spring. hazels are soaked for one week in at night, with water poured off in the morning, and fresh water added before going to bed. leave them for the days to dry. 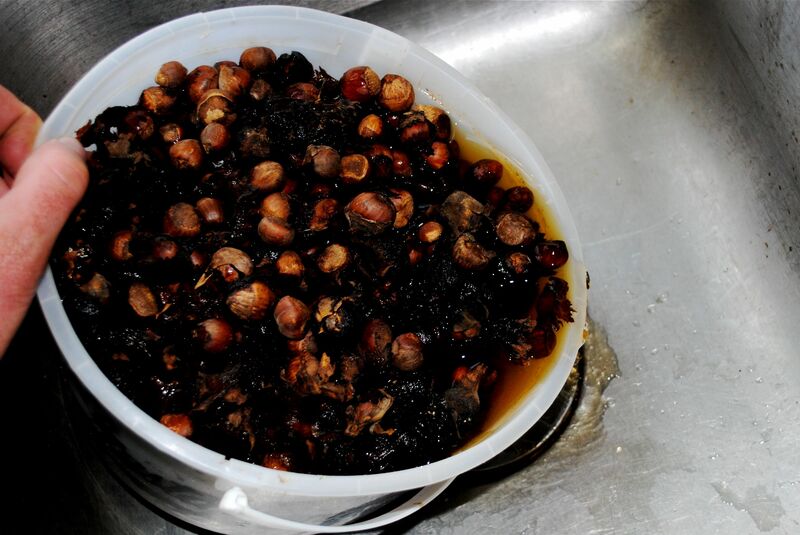 chestnuts are kept in the fridge in an unsealed plastic bag, to keep them cool and moist, but not wet. rather than planting them in pots it was recommended to use five gallon buckets with the bottoms cut off and lined with hardware cloth and sunk in the ground. the bottom is saw off a five gallon bucket, i used a sawzall with a metal blade, and then constructed a sort of wire bowl that i shoved in the bottom, making sure that it fit very snugly, and as i filled it with soil i made sure the weight of the soil was holding it down tight, and forcing it against the sides. 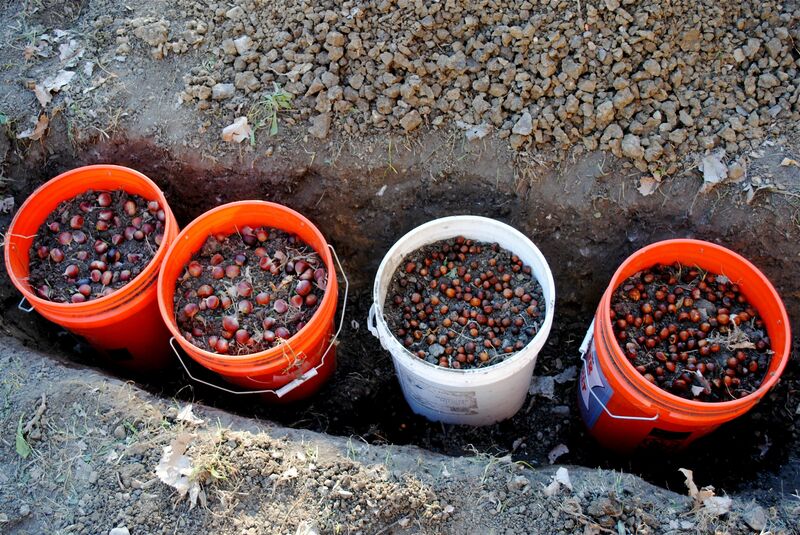 the buckets get placed in a hole in the ground and filled with soil to about 2 inches from the rim. then the hazel nuts and chestnuts are snugged down into the soil. i was told that i could plant a good amount in each bucket, i put maybe 50 chestnuts in a bucket and 75 hazelnuts per bucket. cover them with a couple of inches of soil, tamp it, and water well. then to keep the squirrels out those oh so tasty nuts, more hardware cloth on top, connected with zip ties. then soil put all around the sides of the buckets, then the mulch, lots and lots of mulch. 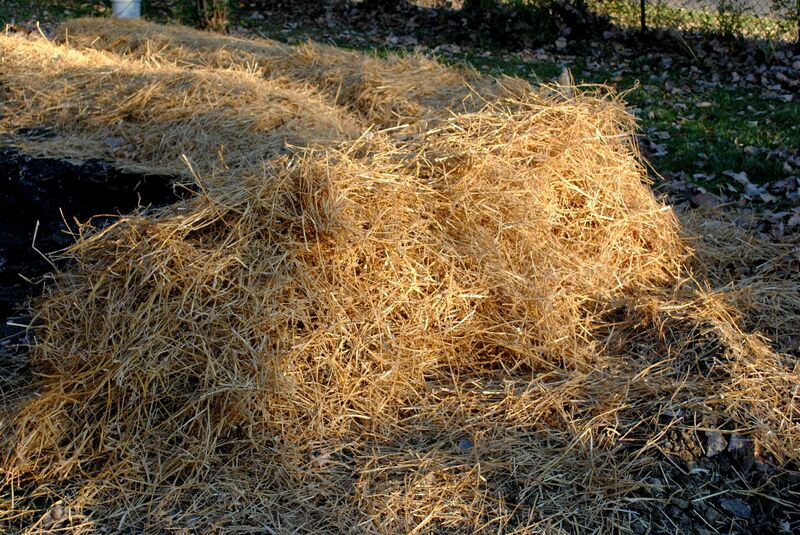 i piled it high, maybe a foot and a half deep, using almost a whole bale of straw on just this little area. i’m going to add more as this packs down, and some leaves as i grab those while out and on trips. it stays this way until next spring when the soil thaws, then the mulch is removed for the summer for them to grow, leaving the hardware cloth on. they make is though another winter and then they are ready to get planted out. now to decide where to plant them out. This entry was posted in edible forest garden, nuts, plant propagating, Uncategorized, urban farming and tagged chestnuts, hazelnuts. Bookmark the permalink. 1. Stick the nuts in the ground where you want the tree to grow. 2. 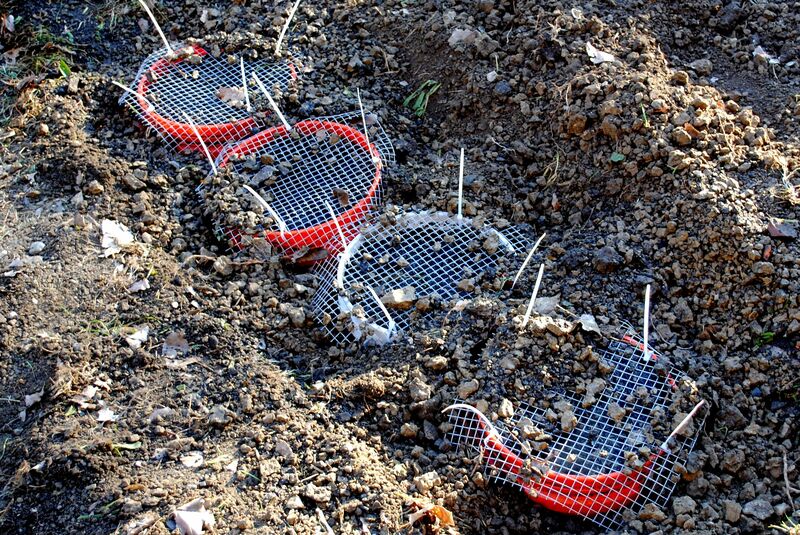 Put a planting tube around them to discourage squirrels, rabbits, etc. 100% of them sprouted and grew. I will thin down to the strongest plant next year. My dad’s method: plant nut in desired site in the fall, cover planting site with a shovel-full of fresh manure (as nut-eater repellent and fertilizer), wait for spring. Worked a treat! Pingback: How to Start a Small Permaculture Nursery and Grow 1000s of Trees by Yourself | Crafty Workshop Project. was it a pain to remove the hardware cloth after the trees germinated? not as long as do it before bud break. Hey Patrick, I know this is quite an old post, but I have a few questions about this method since I wanted to try it out for myself this year. 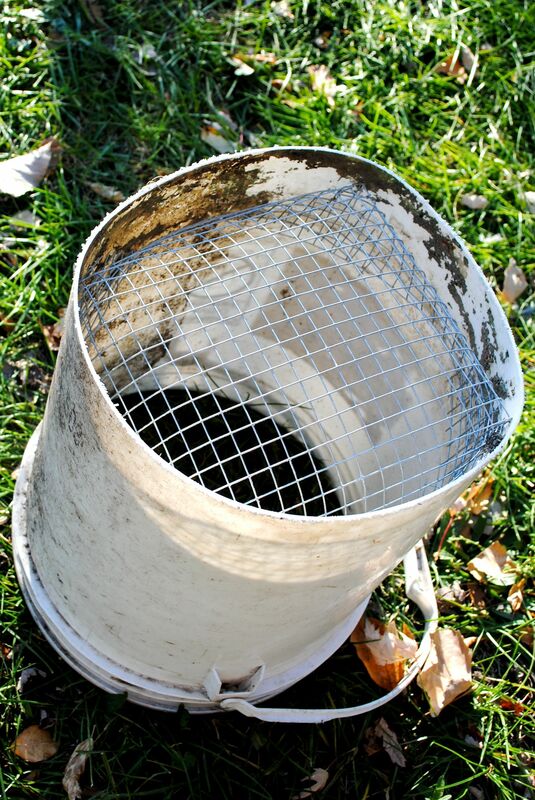 First, is the soil used in the five gallon buckets from the hole that you dig in the ground or is it a bagged soil mix? Secondly, I’m a little confused about the top piece of hardware clothe when it comes to transplanting the tree seedlings. Do you have to cut it off when the time comes? Does it hinder the tree growth at all? Maybe I am just making a bigger deal out of it than it really is, but it seems difficult to not damage the seedlings if the clothe has to be cut out. Can you help me understand this part a little better (like what you did once the trees were ready for transplanting)?